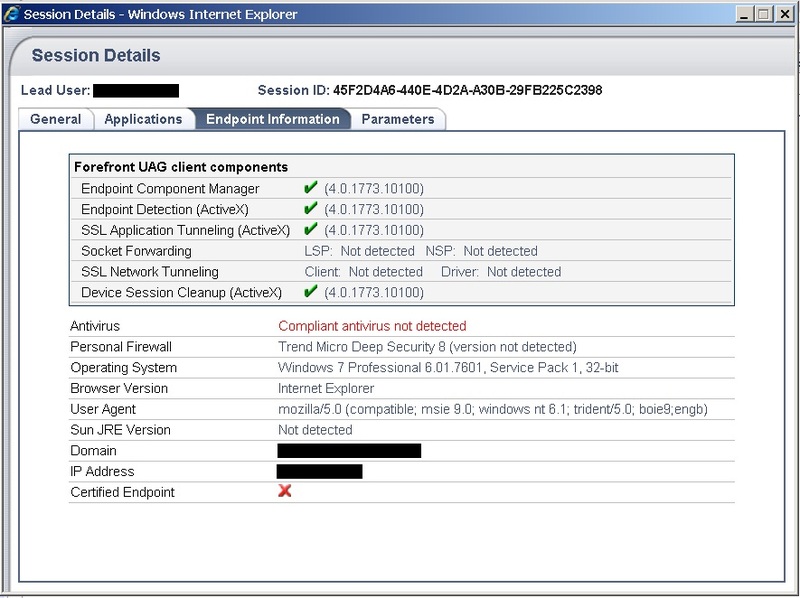 I just noticed Forefront UAG 2010 SP2 has been released as of last week 06/08/2012. Looks to contain lots of fixes as well as improved support for Apple IOS 5.x and Android 4.x devices. See release notes from UAG product blog here or you can just download it here. Warning — This update requires all your clients to install a new version of the ActiveX endpoint component plugin. If you don’t want your clients updating the ActiveX components or you push out the UAG components via msi then do not deploy this update! My experience with the upgrade was not completely painless. I installed the patch on my secondary UAG server in about 3 minutes and rebooted. No worries there. I then installed the patch on my primary UAG server – the patch took a good 20 minutes to install and after the reboot (which isn’t necessary but I don’t trust Windows), when logging into to test, my trunk web pages were not being displayed correctly. I was getting the usual ‘Server Error in SecureTrunk application’ message. What else to do except stop the World Wide Web Publishing service, rename the \von\Conf\WebSites folder and reactivate my trunk confiugration from within UAG Management Console to recreate the trunk web site folders to try fix. I suspected my old friend – the group policy security settings forcing FIPS compliance: ‘System cryptography: Use FIPS compliant algorithms for encryption, hashing and signing.’ I disabled this via GPO and rebooted. This seemed to resolve the issue. Why had this setting changed? Not sure – my web.config file looked unaltered – it was still set to use 3DES encryption which is FIPS compliant. Not sure but I’m going to find out! By default the UAG will pass 127.0.0.1 in the NAS-IP-ADDRESS attribute. RADIUS NAS-IP-Address Attribute is really useful as it allows an arbitrary IP address to be used as RADIUS attribute 4, NAS-IP-Address, without changing the source IP address in the IP header of the RADIUS packets. Why would you want to change this from 127.0.0.1? Some older RADIUS servers need the NAS-IP-ADDRESS attribute to match the source IP address header in the RADIUS packets, so modifying this attribute to the IP address of your internal interface on the UAG will fix this problem. Copy \von\InternalSite\samples\respository_for_radius.inc to repositoryname.inc (in my case IdentityGuard.inc) into the \von\InternalSite\inc\CustomUpdate\ folder. This is documented in this KB article – KB960302. Alternatively if you are trying to integrate the UAG with Risk Based Authentication features included with Entrust IdentityGuard Enterprise Server, you will want the UAG to pass remote access client’s IP addresses in the NAS-IP-ADDRESS field. and client source IP addresses will be passed through to the IdentityGuard Server now. Usually on the UAG logon screen the Authentication name will be prefixed in the password field. For instance if you have integrated with Active Directory and you have put the NetBIOS name as the Authentication name for your Active Directory authentication, your NetBIOS name will be advertised on your logon page. or if you wanted to prefix your company name, just edit String 109 in the relevant languages file. See this post for more info. Make sure you have SP1 update 1 installed – KB2585140. If something is not working (like a Remote Desktop link), run the Best Practice Analyser. This will highlight any issues, like certificate errors that are stopping the application from working. Increase the default session timeouts – ‘Inactive session timeout=300 seconds’ and ‘Trigger automatic logoff after 60 mins’. Way to low for most environments. Increase to suit yours. Enable access for mobile users – This is disabled by default. Customise your portal – Not easy to do, but the sooner you brand it the better. Integrate with a two factor authentication product to increase security. When adding Active Directory integration update the search root and scope to include the domain only, i.e. the root, enable subfolders and leave nested groups blank so every group in the domain is queried. Takes longer but less hassle for Ops teams. Once you have configured authorisation don’t move the groups to another OU in Active Directory or your authorisation will break. To clean up the logon page, remove the language bar, deselect ‘Enable users to select a language’ from the Authentication -> Trunk configuration settings. Update the language files to customise all the logon and portal text.